With minimal effort, you can easily create an inviting outdoor living space for entertaining your friends and family as the summer comes to a close. This living space can be simple, containing only a few of the basics or it can be as elaborate as you desire. 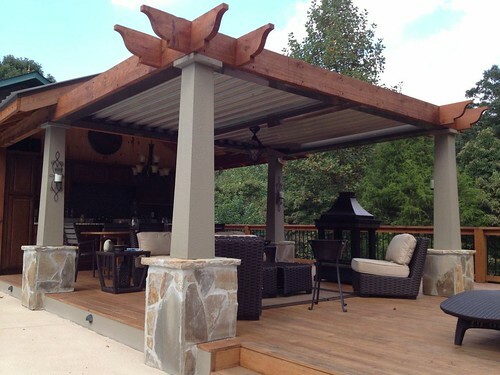 Having a shaded place such as a Pergola or a Gazebo to bring the food outdoors is perfect for small and large backyard gatherings. Of course, there are low cost alternatives like a patio umbrella or gathering of shade trees if you’re running low on available space. The goal is to add a place that provides escape from the heat with a touch of character. If you plan on going out another important aspect of any outdoor space is the cooking station. It’s pretty simple to set up an open aired dining room with a grill and a few tables. You can also check out local surplus stores for some old cabinetry with a sink that you can refurbish and convert to an outdoor bar. A lot of times this kind of cabinetry can also be bought for next to nothing from homeowners who are in the process of remodeling their kitchens. A word of caution about outside furniture, you will want to cover your furniture or bring it indoors at night if you plan on using plump fabrics. With that being said, the craft loving homeowner will undoubtedly find this simple for the most part. However, for us un-crafty homeowners, secondhand cast-offs are perfect to use outdoors since there’s no need to worry if they come with a few dents or scratches. Adding visually appealing elements to your yard can be money well spent. Planting fruit trees, plants and flowers in just the right places can really enhance the aesthetic impact of your home and provide an added boost to its curb appeal. Window boxes are an excellent ways to infuse your yard with nature, color warmth. Another way is to throw flowers into the mix is by adding borders to the front of your property along the fence or in strategically placed plant beds or raised bed gardens. Remember, when it comes to home improvement projects, always make a plan before you start doing any work. There are several details you’ll need to plot out first like allotted room for cooking and recreation areas among others. Once you have everything planned out you can start the construction phase. Your property is a space where you can create a unique kind of space that you and your family can enjoy for years to come; the kind of space where all your neighbors want to hang out and relax. Of course your budget must be considered, and you’ll have to decide whether or not you will do the work yourself or if you’re going to hire a contractor to do it. Reaching your goals and having your dreams come true takes planning, organization and thought, but the end result will be worth the effort.